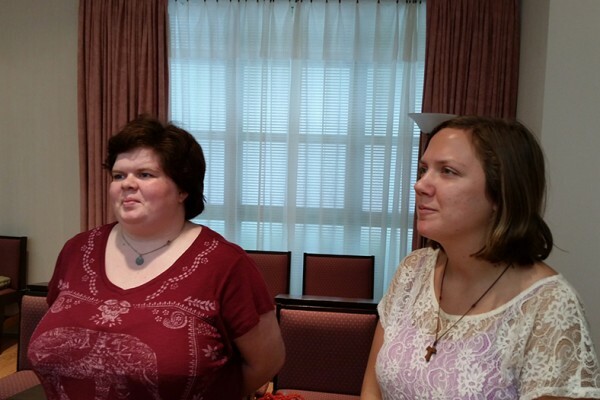 Gabrielle (Gabri) MacInnes and Kayla Danks became Affiliates of the Sisters of the Holy Family of Nazareth (CSFN) on September 29, 2018 at St. Frances of Rome Convent, Tyler, TX. The ceremony commenced in the community room with several readings on the family and the lighting of a candle after each reading. Then, the CSFN Vocation Director, Sr. Emmanuela Le welcomed the candidates and asked them what they sought. 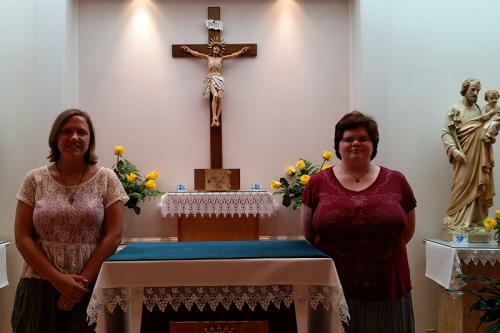 Gabri and Kayla responded together that they wished to search the possibility that God is calling them to religious life as a Sister of the Holy Family of Nazareth. The Sisters, in response to Sr. Emmanuela’s request, shared the statement of our charism and declared their readiness to pray for the Affiliates and to support them on their journey. Sr. Malgorzata Majszczyk, Superior of St. Frances of Rome Convent, standing in for Provincial Superior, Sr. Kathleen Maciej, entrusted the Affiliates to their director, Sr. Gemma Pepera. Sr. Malgorzata, then, gave each affiliate a candle which, later, glowed on the altar in the chapel for the remainder of the day. That was followed by Gabri’s and Kayla’s reception of the medal of the Holy Family/Mother Foundress, a framed picture of the Holy Family and copies of Christian Prayer and our JMJ Manual. All present greeted the new Affiliates. In addition to the residents of St. Frances of Rome Convent, Srs. Malgorzata, Sylvia, Gemma, Michaela, and Josephine, Sr. Emmanuela from Irving, TX along with Sr. Marietta Osinska and Sr. Mary Paul Haase from Grand Prairie, TX participated in welcoming Gabri and Kayla. Kayla’s parents, John and Brenda Danks, and her brother and sister, Jacob and Samantha, were also present. Gabri, 22, comes from Minnesota, but her parents recently moved to North Fort Meyers, FL. Gabri graduated in May from the University of Dallas with a degree in psychology. Kayla, age 20, grew up in Wichita Falls, TX. She is a student at Tyler Junior College. For information on becoming a Sister of the Holy Family of Nazareth, including formation stages and upcoming vocation events, please visit Become a Sister. Laboure Society recently featured Gabri in a video about her discernment process. Watch it here.